The meditation circle was used for walking meditations this spring and summer, but I never got around to planting anything new until fall. During the first week of October I added red Antirrhinum majus (Snapdragon) and blue Viola (Johnny-Jump Up). Both are blooming right through the unusually cold, record-setting weather we have had for the past week. A few violas also volunteered from last year but not in their designated spot. The planting areas are supposed to form the “wall” between the pavers that form the path. Instead the violas and actually, quite a few Penstemon Digitalis (Beardtongue) ‘Huskers Red,’ have spread themselves around in-between the pavers. I left most of them for now even though they have not followed the rules. Early next spring I want to add back some Iberis Sempervirens (Candytuft). This image from a couple of years ago shows one of my favorite plantings in the circle (of course, it was May). Not much is left of it today except the very reliable Husker Red. When the labyrinth was first conceived I had imagined planting it one time with perfectly chosen plants and reaping the pleasure for years to come, but instead I guess I will reap the pleasure of devising and experimenting with new planting schemes. I had not taken into account at the time such outside forces as drought, standing water or voles. Several garden visitors have remarked at how the meditation circle has grown in and become more integrated into the rest of the garden. It is true, but in some ways I prefer the more spare and stark look it had when it was first built. This year the various thymes thickened and crept toward the pavers. I thought I would like that effect but now I am tempted to trim them back to be more tidy. It looks drab now but Thymus serpyllum ‘Pink Chintz’ (Pink chintz thyme) in the center of the circle bloomed from the first of July until the end of October. All the thymes should remain evergreen through the winter. Detail of thymes creeping over the path. Today’s monthly garden club meeting featured Jihye Schumann, a designer who began studying floral design 14 years ago in Korea. She demonstrated making arrangements for the home with fruits, vegetables and flowers. Unfortunately I did not have a chance to get pictures of her more elaborate creations, but I did win one of the small ones in a raffle. 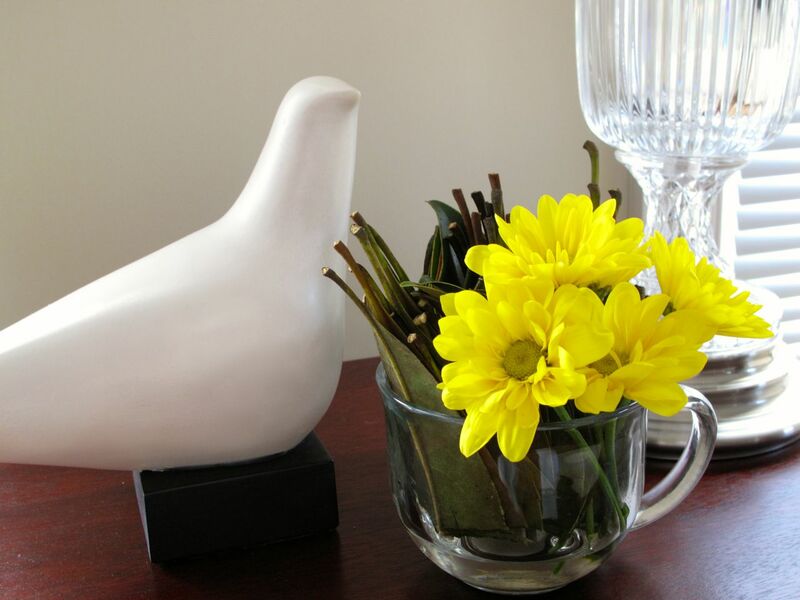 Jihye showed how to create a simple and inexpensive display to decorate a tea table by filling three inexpensive glass cups with chrysanthemums from a grocery store and found magnolia leaves. My photograph does not do this justice. Since I could bring home only one of the cups I cannot show the full effect, but the display of three looked quite nice. She suggested adding candles and a teapot to the three cups of flowers and everyone nodded, envisioning how lovely that grouping might look. The interesting part was how Jihye manipulated the fresh magnolia leaves. First she stacked and aligned about a dozen leaves so they were all pointing the same direction, then she cut them in half with scissors. Next she restacked the leaves tightly, such that the cut sides all faced down. She inserted the stack into the container with the cut side down. She repeated the process two more times so there were three groups of leaves and then she just added a few stems of flowers for color. Simple, but unusual. 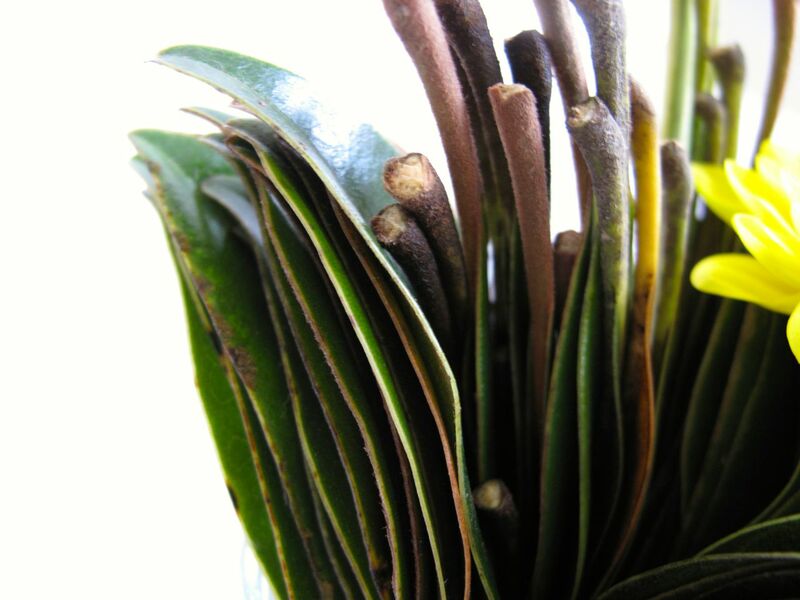 Magnolia leaves, stacked and cut in half provide the foliage. This entry was posted in garden and tagged floral arranging, Floral Design, labyrinth, meditation circle, meditation garden, meditation path on November 18, 2014 by pbmgarden. I hope to be able to see your meditation circle one day up close and personal. Pretty magnificent, I can’t wait to see it this spring. Thank you Charlie, I will try to fix it up some for spring. The red snapdragons really add some cheer to a dreary month. Personally I would go insane if I had to live with the same plant combinations, perfect or not, without making changes. I have to change because I learn about new plants, get inspired by a new idea, or simply have changed my own personal tastes. You make a good point. I find myself though always having to go back to problems I thought I solved. The circle is a bit drab except for the pops of snapdragons now, but actually my original plan was to at least have something semi-evergreen to keep it moving through winter. On that level I thin I succeeded. Can’t beat May flowers though! True, but you can’t judge winter by the standards of spring. I can understand that the meditation circle is difficult to plant; the bed widths are quite narrow and you maybe don’t want taller things that would brush against your legs as you walk (especially if they were wet. The obvious choice might be something chipped, myrtle maybe that has lovely scented leaves, grows very slowly, has beautiful white flowers and can be chipped to shape, you could keep the thyme between the slabs. 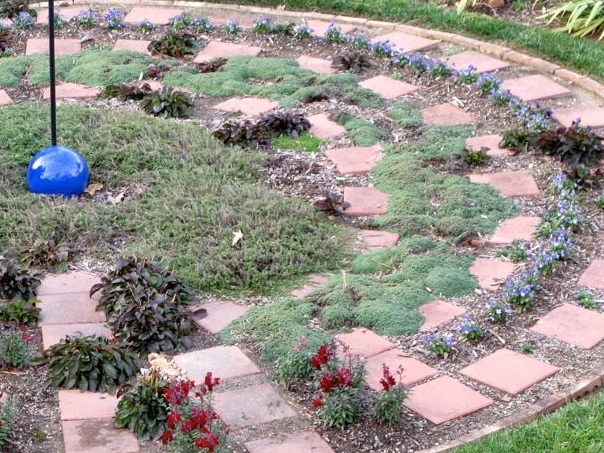 I do like the idea of the meditation circle a lot and also like the images of when it was first planted. Thanks for the suggestions Christina. I do like more height than what I have now, not more than 2 feet (0.6 m). What kind of myrtle do think might work? The only one I know here is wax myrtle and it grows into tree size eventually. Wish I’d been able to make the planting areas wider. 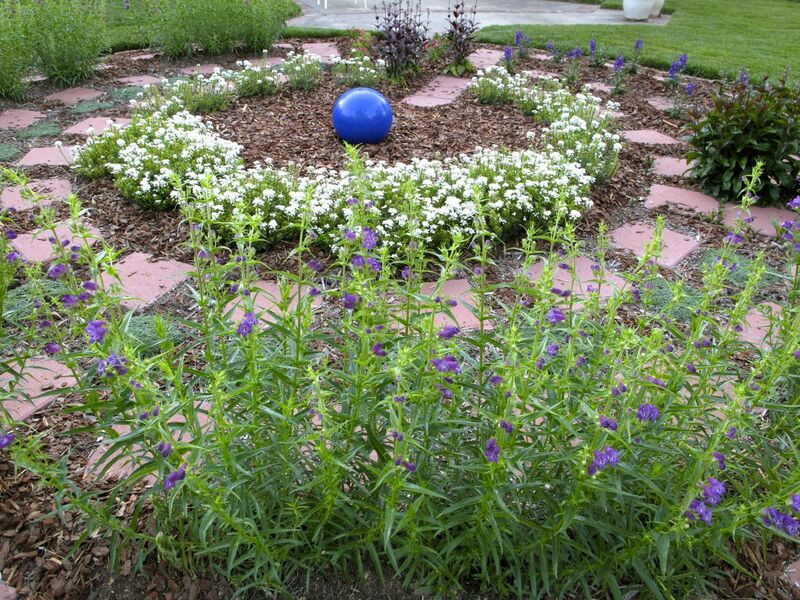 Hi Susie, this is an interesting look back on your meditation circle, I can see why you like the planting in May, its very pretty. I am late to your blog, can you tell me more about when you put the meditation circle in. I see too from your recent photos that your chimes are still down. Loved the glimpse too into your garden club meeting too, I like the creative use of the magnolia leaves, it seems very respectful. Thank you Susie, I have just looked back on your posts,that was interesting to see how your Meditation circle has evolved and your planting has changed, the chimes seem such an integral part of the circle, being able to hang then again will at least be one benefit of the colder weather. I appreciate you taking the time to check it out Julie. Thanks Judy. Yes I go back and forth about this area, but it has been overall a great focal point and such a peaceful addition to the garden. That arrangement with the magnolia leaves really is unusual. Quite clever in fact as it provides the flowers with some support and looks very neat. I love the red snapdragons in the circle Susie, and the Iberis were wonderful in spring. I also think it’s nice changing the planting now and then. I wonder if you have considered using heat and drought resistant sempervivums or ground cover sedums in part of the circle as they spread nicely and need little care. One of my favourite sedums has golden flowers for several months in spring and summer. I think it’s called Weihenstephan Gold. The magnolia treatment was simple and as you said, provides support for the flowers. Nice technique so oasis or frogs are necessary. I like the idea of manipulating leaves–just ordered a book on it. The Weihenstephan Gold is very pretty–searched and found a picture. Thanks for the suggestion. I have a pot of mixed sedums that grew over the sides and continued spreading into a section of the garden and a path near the gate, so it might work here. Hi Cathy, thanks for the myrtle clarification and other suggestions for my circle. I’ll look these up. If the garden club posts photos of the magnolia leaves and other arrangements from the meeting I will let you know. Too bad I didn’t get pictures of them all myself. I guess the problem is making up my mind. I wasn’t motivated much to garden this year but by January I think I will be itching to get outside and take care of it again. Hello Susie, I have missed a few posts, they stopped appearing in my WordPress reader. I love the thymes spreading in your Meditation circle. And that is a great way of using camellia leaves in an arrangement, I am going to try it. Thanks Liz. I’ve just been visiting your foliage post. I’ve had problems with the reader also sometimes. Thanks for stopping by. Your thymes look very happy! I have not managed to successfully grow thyme, ever. Thanks! The thymes would prefer it to be a bit drier I imagine than what they get here. Drainage in the circle is not very good, but they bloomed and bloomed this year. I keep trying to grow lemon thyme but it never makes it. Susie: I actually tried a version of Jihye’s magnolia leaves. A friend, with a huge tree, gave me tons of leaves a few days before Thanksgiving! My glass containers were square which I think didn’t work as well as the round. But everyone at the table thought it was a wonderful idea…and so simple! That great Libby! I hope to see a photo next time I see you. Can’t make it to the tea this week but hope you will be able to–should be very nice.